We have been running a weekly series using this track and by all accounts its very fun and working well. Fun little oval. It comes with four dirt events and two paved. The Canadian Tire 100 is the only day event. This will install Scotia Speedworld version 1.3. Hopefully all issues have been addressed. Please visit www.gator-tracks.com if there are any questions or comments. This is the first track I ever made and sat on the shelf for over a year until Ron ODell from www.calrace.com picked it up and made a lot of improvements. Who knows if I would have ever finished it without Rons help. 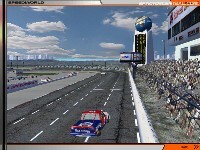 Also many thanks to the guys at www.raceFMS.com and www.NAWSCAR.com for their feedback and support. Pictures of the track, supplied by Jason Inch helped tremendously. Check them out on the website. Grandstand model from racesimcentral. Thanks to Panoz4pres for the pace car. If I missed anyone contact me and I will rectify it. Delete any previous versions you may have before installing. This track is 15 minutes from my house and I think it's awesome that I can actually race here!!!!!! THANKS G8R!!!!!! !